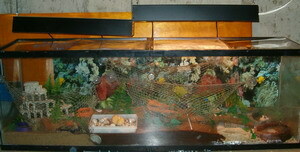 NOTE: The tank or habitat of land hermit crabs is often referred to as a Crabarium, Crabitat or Crabitank. This is a pet name for a hermit crab’s home. The best housing is a glass tank with securely fitting lid. 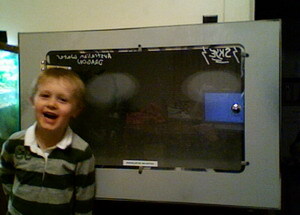 A glass tank with lid helps keep the needed humidity and temperature levels stable. You should allow a small gap between the tank sides and the lid if condensation begins to appear on the sides of your tank.Disadvantages:Glass tanks, unless second hand, are somewhat expensive but worth the extra expense. If you have a lid that doesn’t allow for a gap for air circulation you can get a build up of condensation on the walls, which can cause bacteria build-up within the tank and create unsavory conditions for your hermit crabs to live in. 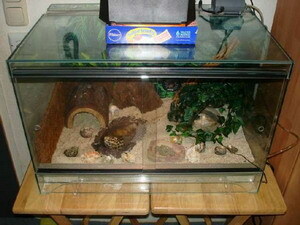 A ten gallon (10G) glass tank with lid is the minimum recommended size and will house up 2 small hermit crabs. If you have hermit crabs larger than a grapefruit then you will definitely need to upgrade to a larger tank. Larger crabs need more area to dig and moult, and to de-stress. There are different shapes and sizes of glass tanks. The most popular type are called ‘breeder’ tanks and they are more cube-shaped than the standard ‘tall’ fish tank and have more floor space. 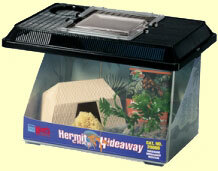 If you want a crabarium that will be more hermie-friendly, why not save some cash and get a custom tank built. Land Hermit Crab tanks do not need to have a bottom made as thick as with fish tanks do since they are not filled with water. If you phone around the different pet stores and aquariums, there are some custom tank builders that you can get a quote from to build to your specifications. 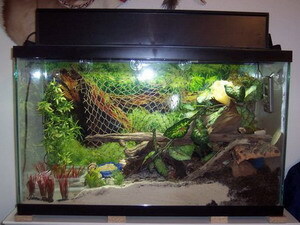 A popular size of custom made tank is a 2ft by 2ft by 1.5ft tank. It looks much like a ‘cube’ in shape, and has a base of 4 square feet. You will find that it is much easier to fit everything inside the tank that is essential, and that hermit crabs will not need to do the ‘spider walk’ along the edges of the glass because there is more room. 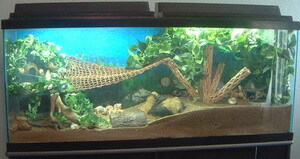 Most fish tanks are very long and tall because fish are able to make use of the vertical height. 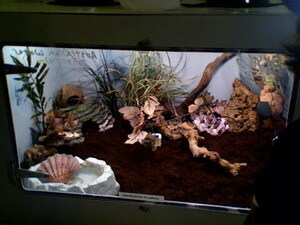 If you cannot get a custom made tank, try making use of the extra vertical space by installing levels or fixing climbing items such as sanitised mangrove root trees, sanitised driftwood, coral trees, ZooMed’s Jungle Gym, or even more creative, a network of choya (or other sanitised wood logs) that hermit crabs can climb and hang upside down and move along the network. Despite what your pet store or crab cart will tell you, land hermit crabs do not fare well in the plastic tanks with vented lids. If you do have a plastic tank with vented lid, the first thing you will need to do is cover some of the vents. You can use saran wrap (cling wrap) or sticky tape for this purpose.